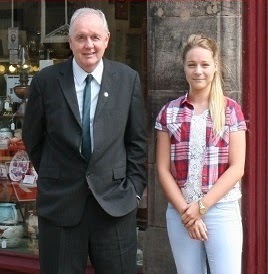 Specialist retailer Hambys has taken on a new apprentice at its Rotherham High Street stores. A family run firm, Hambys has two stores on the High Street, one selling shoes and accessories and the other just up the road which has three floors of antiques. Alicia Caster from Rotherham, aged 17, had been looking for work when she applied for a traineeship at the Source Skills Academy. It also has a centre on Rotherham's High Street offering advice, guidance and training services to Rotherham businesses to increase skills levels and to support trade in the town centre, attracting new investment. During her traineeship, Alicia had the opportunity to do a work placement at Sheffield Showcase, a council funded initiative where empty shop fronts are used to display the work of local artists and promote local retailers whilst also giving young apprentices the opportunity to practice their visual merchandising skills. The Showcase team coached Alicia on a range of retail activities whilst working at Showcase and at the scheme’s charity shop First in Best Dressed. Andrea Cavanagh, tutor at The Source, said: "When Alicia first came to us she was quite shy but after working with our team of apprentices, her confidence began to grow and so did her communication and team working skills." It was then that Alicia was identified as a candidate to progress onto an Apprenticeship that was available at Hambys in Rotherham. Alicia attended the interview and impressed owners Chris and Tracy Hamby who offered her a work placement trial to see how she got on. She took to her new role instantly and has since commenced a full Retail Apprenticeship where she is studying towards her Level 2 in Retail. Alicia (pictured with George Elliott, account manager at The Source), said: "I'm really enjoying my role at Hambys - I like working in both the Hambys stores as they’re quite different so it keeps things interesting." Tracy Hamby, added: "Alicia has definitely settled in to her new role now and it feels like she's always been here. She’s very helpful and pleasant with the customers; it was a real bonus that she had retail experience through her traineeship as she already knew how to use a till and how to talk to the customers. She is fast becoming a key member of the team."